For carpets that have soaked in the daily mess of life, Lane’s has revolutionized carpet cleaning with this newly formulated rug and upholstery shampoo. This unique dry carpet cleaner requires no water to activate the cleaning agents and works instantly upon application. For all levels of stubborn stains, from loose dirt to tough messes, the included trigger sprayer (16 oz. and 32 oz. only) allows you to directly target the area in need and concentrate the deep-cleaning solution to penetrate and eliminate the causes of odor in your vehicle within seconds. The heavy-duty ingredients are great for all carpets, cloth seats, headliners, and seatbelts, making it the best carpet cleaner for a professional strength clean to restore the look of your interior. Step 1 – Vacuum the area you wish to clean with a wet/dry vac. Step 2 – Use Lane’s Pet Hair Stone on seats and carpets (if excessive pet hair exists). Using the Pet Hair Stone will gather excessive pet hair into clumps for easy removal. Step 3 – Spray Lane’s Dry Foam carpet and upholstery cleaner directly onto the surface you want to clean. Step 4 – Agitate the area you have just sprayed with a Carpet Brush (for carpets and floor mats) or an Upholstery Brush (for seats). Step 5 – After scrubbing the area, it is recommended to wipe with a dry towel (you might want to vacuum again if the scrubbing process kicked up any ground in dirt or pet hair). Dry Foam can also be used on headliners by adding 2-ounces into a small bucket with warm water, dampening a microfiber towel, wiping the headliner with the dampened towel and then wiping off any excess with a dry towel. Product worked fantastic to take out water stains on car upholstery. Nothing else worked previously! I had difficulty with the trigger sprayer (included). The product is highly concentrated, so it comes out in sudsy spurts rather than spraying like water. Thus it spilled on other parts of vehicle, and my trigger hand. Best to pour into bucket and mix with water (directions vaguely indicate this), unless you are doing spot jobs. This is one amazing cleaner I used it on my Acura RL and it is amazing now I need to do my truck. Highly recommend this product. 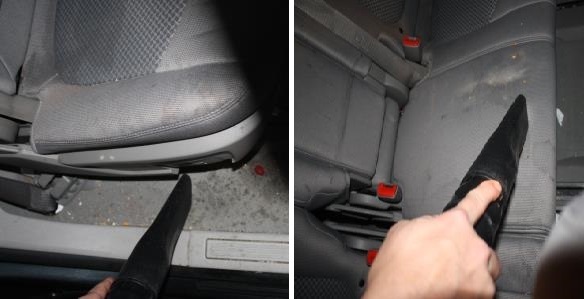 This product was able to make a ruined back seat look brand new. I had used 6 other products from auto zone and Wal-Mart and no other cleaner could take out any of the stains this car had. I highly recommend this product to anyone reading this.